Includes 4 Sleep Learning programs in 1! Get a deep, amazing sleep that will revitalize you, while learning how to find your spirit guide, connect to your higher self, and control your dreams. It's all here in this Sleep Learning System collection, from certified hypnotherapist, Joel Thielke. Remember your dreams clearly and vividly, and be able to pull details from dreams and find the meaning. Find out what your dreams have to say! 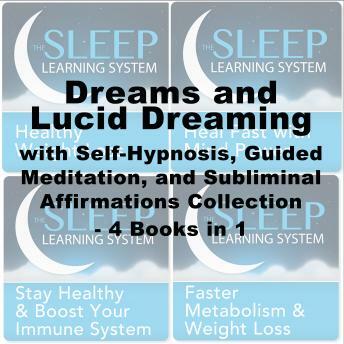 Train your mind to lucid dream, and start controlling your dreams today with this safe and easy-to-use program. Get in touch with your spirit guide, ask it questions, and get guidance if you’re feeling a little lost or need help with confidence, nurturing, and motivation. We each have a Higher Self, and you can connect with yours today. Own your power and the natural gifts you possess, and connect with yourself on a higher plane. Joel Thielke’s guided mediation system gives you positive suggestions that will help you quiet your mind and melt away stress, leaving your body deeply relaxed for a great night’s sleep. The special Sleep Induction will gently guide you into your REM stage of sleep, working with your subconscious to make lasting change that you can see. It’s easy to use and you’ll see fast results. Why wait? Embrace and explore your dream world today with The Sleep Learning System.